About 50 species of wide distribution. Besides the following numerous other species occur in the southwestern United States and Mexico. Type species: Acrostichum Marantae L.
Cheilanthes dealbata Pursh, Fl. Am. Sept. 671. 1814. 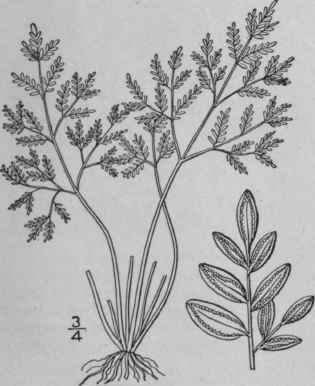 Notholaena dealbata Kunze, Amer. Journ. Sci. (II.) 6: 82. 1848. Notholaena nivea var. dealbata Davenp. Cat. Davenp. Herb. Suppl. 44. 1883. Rootstock short, chaffy with slender brown scales. Stipes closely tufted, wiry, very slender, shining, dark brown, 1'-4' long; leaves triangular-ovate, acute, broadest at the base, l'-4' long, 3-4-pinnate, the rachis dark brown or blackish and wiry; pinnae ovate or deltoid-ovate, mostly with long slender stalks, the pinnules also mostly stalked; segments ovate-oblong, or somewhat elliptical by contraction, small, white and powdery on the lower surface. On dry calcareous rocks, Missouri and Nebraska to Texas and Arizona. June-Sept.